Paul Gauguin paintings were not truly appreciated during this artist's lifetime. Only after his death did people begin to understand the complexity and depth of Gauguin paintings. Paul Gauguin famous paintings didn't run with the Impressionist flow. Gauguin used a bolder approach to color when he painted, a style that directly influenced some of the most famous modern artists, including Pablo Picasso and Henri Matisse. 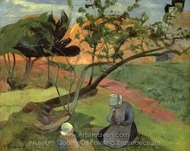 Paul Gauguin paintings spearheaded an anti-Impressionist art movement in the late 1800s that was dubbed "Synthetism." 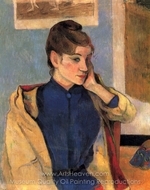 Gauguin and others used this term because their paintings differed from the Impressionism approach. 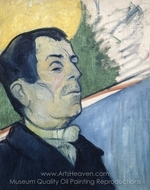 Gauguin paintings used color in a two-dimensional way to emphasize flat patterns instead of the soft, thick, layered brushstrokes of Impressionist painting. 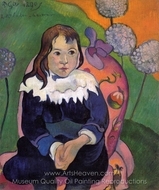 Gauguin was a key figure in the Symbolism art movement that swept through France, Russia, and Belgium during the latter part of the 19th century. Many Gauguin famous paintings were philosophical; a key factor in the Symbolism art movement. Perhaps because he so heavily influenced such groundbreaking artists as Picasso and Matisse, or perhaps because a majority of Paul Gauguin paintings were snatched up after his death by a private Russian art collector named of Sergei Shchukin, original Gauguin paintings aren't for sale. Collectors lucky enough to find original Paul Gauguin famous paintings for sale will have to pay upwards of $33 million to get their hands on a true Gauguin. Fortunately, many of Paul Gauguin's paintings are replicated and sold at a price tag far more reasonable than the $33 million or more an authentic painting would fetch. 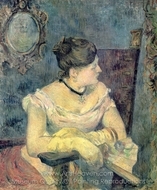 Even more fortunate, because of his influence on post-Impressionism and Modern art, many artists study Paul Gauguin's technique until they refine the mastery he used when he painted. 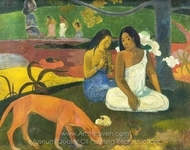 Art collectors looking to add Paul Gauguin paintings to their collection are going to have to buy a replica. Art dealers know this and understand the insatiable desire for a Gauguin. Arts Heaven specializes in replicating Gauguin paintings with startling accuracy. 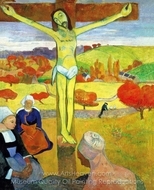 Painters use the same brush stroke and color technique Gauguin used when he painted many Paul Gauguin famous paintings. A replica Paul Gauguin by Arts Heaven will turn a home art collection into a museum-worthy viewing piece … for several million less than the going rate of a real Gauguin. 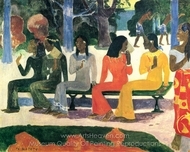 Paul Gauguin paintings redefined art in the late 19th century. He hobnobbed with some of the best, like Van Gogh, and Gauguin paintings influenced some of the best, like Picasso and Matisse. 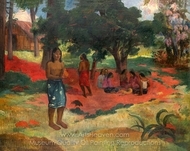 Paul Gauguin famous paintings hit a nerve when viewers gaze upon their intricate detail and bold use of color. No two-dimensional image looks so grand in a three-dimensional world as a Paul Gauguin. - NYU School of Medicine: Paul Gauguin Where Do We Come From? What Are We? Where Are We Going?